AUBURN HILLS, Mich. The Miami Heat said Friday the franchise didn't agree with the one-game suspension given to Dwyane Wade for making contact with Charlotte's Ramon Sessions earlier this week. "While we accept the decision of the NBA regarding Dwyane Wade, we do not agree with it," the team said. "In his 10 years in the league, Dwyane has never been suspended, and has been an exemplary player and positive influence to his teammates and fans and we have been honored to have him as part of the Miami Heat family. Unfortunately, he is the type of player, along with other players on our roster, that defenses take privileges with. We stand with Dwyane and support him in this situation and have made our feelings known to the league office. Wade was suspended for Friday night's game at Detroit for flailing his leg and making contact with Sessions' groin during the Heat's 105-92 victory over the Bobcats on Wednesday. Wade tweeted Thursday that he's not a dirty player and was just reacting to contact with Sessions during the game. 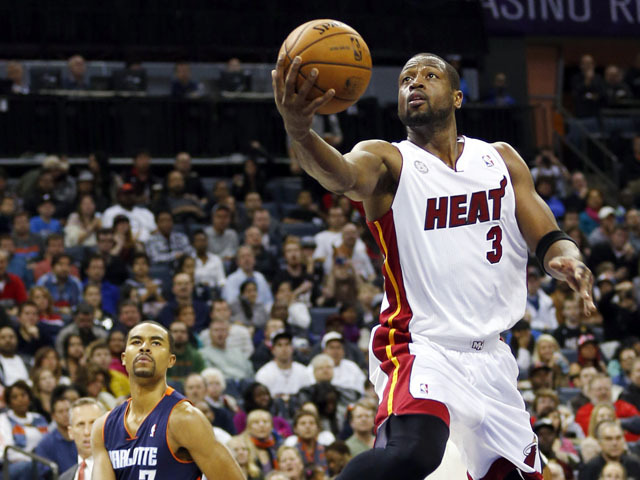 "You'd kind of have to be there," Wade said at Friday's shootaround. "With the whole video, it could be taken any kind of way. Like I said, I've made my statement and I'm looking forward to moving on and getting ready for tomorrow night" against Milwaukee. He said he would try to look at Friday as a "rest day" and hoped to watch Friday's game against the Pistons on TV. He quipped that he needs to get the NBA League Pass on his mobile phone but "it was expensive the last time I checked." Bobcats coach Mike Dunlap said a penalty was necessary. "I thought they were going to do something and when we looked at the film it was obvious that they had to do something," Dunlap said before playing the Brooklyn Nets. "Competitive juices got the better of Dwyane. I think he's a class human being, I think he represents the league at the highest level. He's an Olympian, got us a gold medal, but there's no place for that." Coach Erik Spoelstra said Mike Miller would start at guard, and Ray Allen  who missed the Charlotte game because of a sore right shoulder  was ready to play. "We're a no-excuse team, and we've prided ourself on that," Spoelstra said. "These are the circumstances we've been given, and we feel that we have enough depth to overcome it."